Although I am not a Trekkie by any means (this is only my second viewing of a STAR TREK movie) I still enjoyed this movie. However, I think that the makers of this movie could have and should have done a better job. First of all, this movie had some discrepancies. For instance, the bad guys in this movie are the Borgs. In the beginning of the movie, before we are able to see a Borg, we see two people attacked by a lightning fast shadowy creature. But later in the movie, when we finally see the Borgs, they are slow people who hardly notice the members of the crew and are somewhat reminiscent of Frankenstein, Michael Meyers, or the Tortoise: slow and steady, yet determined. What also did not quite make sense is that the Borgs view themselves as being perfect, yet they are horribly ugly and very dirty and slimy. I'm sorry, but that does not sound perfect to me. There were other anomalies that just didn't fit as well. On the other hand, this movie does have some great special effects, which makes it better than some of the old STAR TREK movies that were horribly unbelievable. Also, the story was pretty interesting and made this a good science fiction flick. Those familiar with STAR TREK and its storyline will definitely get more out of it. I was lucky to have my woman tell me some of what was going on as she and her dad are STAR TREK fans. The music as well was quite exciting and inspiring. However, I was not impressed with the action scenes placed in this movie. The action was most of the time too slow. But when the speed did pick up, it was terribly confusing, hard to follow, and just did not flow right. This movie also had some horrible one-liners that made me quite embarrased for the movie and for its actors. While this works in some movies such as an Arnold Schwarzenegger film it does not work for STAR TREK whose crew are simply more intelligent and somehow above that sort of thing. However, what perhaps saved this movie was a wonderful performance by Patrick Stewart who I feel is a great captain as Jean-Luc Picard and much better than William Shatner's Captain Kirk. Not only does he have the best first name of all time, but Patrick is simply captivating to watch. He definitely saves this movie from becoming one only for the most die-hard Trekkies. I have always enjoyed his performances in the little I have seen of him on TV as well. So now the question is, should you see this movie? If you are already a STAR TREK fan, then the answer is a resounding YES. 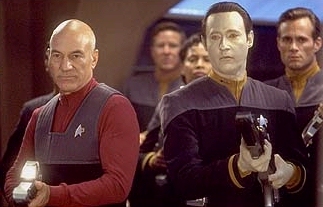 However, if you are not a STAR TREK fan, then I don't think that this movie alone will make you one. Nevertheless it is entertaining and is probably not a waste of time. How would you rate the movie STAR TREK: FIRST CONTACT? There have been 9579 people to visit this page since Tue, Dec 10, 1996. And you are the first person to visit this page today!